Is it really better to be single on the "day of love"? We think...yes. 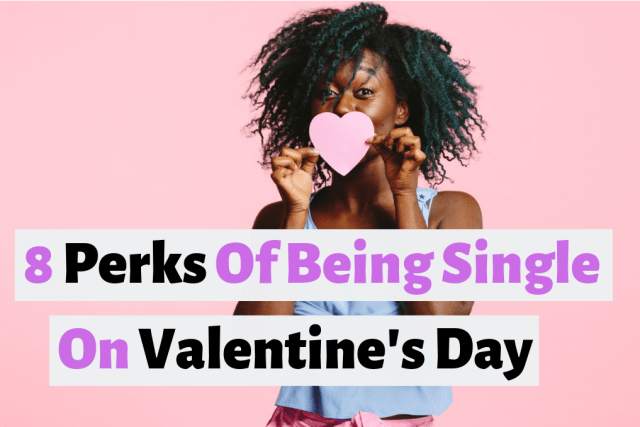 Who says that it's a bad thing to be single on Valentine's Day? Click here to see why it's awesome to be single on the day of love. 2. You won't get disappointed when things don't turn out...Let's face it, V-day is usually a bust. Save yourself the disappointment and stay single. Next! 3. You can buy your favorite candy on sale later for half the price...Plus you can get exactly what you want! 4. You can binge romcoms...there's gonna be a ton of classic romcoms on TV that day. When Harry Met Sally? Yes please. 5. You can openly diss the lovers around you...You're single...you're allowed to be bitter. 6. You don't have to deal with the guilt. The expectations are so high on Valentine's day. Too much stress. Next! 7. You might bump into your next love. 8. Avoiding the Valentine's Day mid-relationship crisis. More people break up around Valentine's day than any other holiday. Avoid a mid-relationship crisis by staying single.